12th March 2014 – Memberships are now due for renewal for the next year, notably 1st April 2014 to 31st March 2015. If you’d prefer you can now pay online. If you would prefer to pay by post, but have lost your Renewal form, another one can be printed off here. 12th March 2014 – Our latest Newsletter (21, Spring 2014) can be downloaded from the Newsletters archive. 12th March 2014 – We have updated our Timetable Library, to include all changes in Luton and South Beds this month. 18th February 2014 – Our Treasurer and Secretary are looking to retire, after a good few years on the Committee. We therefore have Committee vacancies for these positions, in the near future. Please download the job specifications for either the Secretary or Treasurer. These are unpaid voluntary roles, but would be ideal for anyone who wishes to take the group to the next level. Call our enquiry line and leave a brief voicemail, or email us, if you are interested, and we will get back to you. 14th February 2014 – From Monday, there are changes of up to 10 minutes on Service 50 from Bedford to Kettering. Download the new timetable here, or via the Timetable Library which has been updated. 2nd February 2014 – The Timetable Library is now fully updated. 28th January 2014 – Bedford Bus Station is closed for redevelopment for most of 2014. Download a copy of the new Stopping Arrangements via this link. 28th January 2014– Minor changes will occur to some Grant Palmer and Arriva services from Monday 3rd February 2014. These timetables will be on our Timetables page by the end of this week. In the meantime the GP timetables can be had via this thread on our Bulletin Board, and the Arriva timetable files via this post on the H2T blog. 24th December 2013 – Newsletter 20 is now online, which includes a full list of all Christmas & New Year bus services in our coverage area. Also enclosed was a Calendar as part of the original printed booklet, but download this one-piece sheet, will look a bit better printed off. These were posted to members in the preceeding week. 24th December 2013 – Merry Christmas and a Happy New Year from the BABUS committee and especially your Comms Officer Suzy! 2nd September 2013 – Our most recent Newsletter 19 is now ready for download, which includes full explanations of all the recent service changes. You can also view all the back issues via our Newsletter Archive. 31st August 2013 – You can now Join Online! This facility is now online in association with PayPal – meaning you can pay with your credit, debit cards, or PP balance. Visit our Membership page for more information. 31st August 2013 – Our new-style BABUS Newsletter 19 will be online from Monday 2nd September 2013. As it stands, the paper copies were printed yesterday, and will be posted out this coming week. Electronic newsletter subscribers are being sent out tomorrow (Sunday 1st September 2013) and the e-copy will be online the following day. 31st August 2013 – We’re now on Social Media! You can now find us on Facebook and Twitter – please feel free to add/like us. 31st August 2013 – A full update to the Timetable Library is happening, incorproating changes to the Bedford borough rural services by Grant Palmer, and changes in the south of Central Beds routes crossing into North Herts, and locally in Biggleswade. Visit our Timetable Library for full details. p.s. Please be aware of roadworks in the Brickhill area, which will require the new 20/21 to be rerouted during this time. Visit this page for more information. 25th July 2013 – BABUS members may well have been confused by announcements from Stagecoach East regarding timetable changes in Bedford. These changes were submitted electronically to the Office Of The Traffic Commisioner at just a few days notice – not the regular 56 days – and thus requiring “short notice” approval by the TC and each local authority involved. While they were not appoved in time for the inital June date, they will now certainly be happening from this coming weekend! So if you use Service 4 to Goldington, Service 6 to Brickhill, Service 10 to Goldington, Service 41 to Northampton, Service 42 to Flitwick, Service 51 to Oakley, Service 52 to Cranfield, Service 53 to Wootton, Services 71/72 to Hitchin, Service 73 to Biggleswade via Sandy, Service 74 direct to Biggleswade, and Service 81 to Luton, then please follow each link for all the revised timetables. There will be some changes up to 10 minutes earlier or later than now, and some journeys are being speeded up on Saturday and School holiday mornings – please check the new timetable carefully. You can also download updated out-of-town timetables via our Timetable Library which will be updated after the changes this weekend. 25th July 2013 – the BABUS summer newsletter is under construction. All members are welcome to send information or ideas to suzy.scott@babus.org.uk before the deadline of Tuesday 13th August 2013. 21st May 2013 – Our Annual General Meeting will be held at Bunyan Meeting, Mill Street, Bedford, MK40 3EU. Click here if you need help finding the place. (This is a different venue as the other two we used recently now have ongoing Saturday block bookings now). This will be on Saturday 15th June 2013 at 10.15. After formal business has been attended to, we will have a talk from Mr Paul Dodge, public transport manager at Central Bedfordshire Council. If you need more information, or wish to help us promote this, click here to download a poster. 21st May 2013 – Our Spring/May 2013 Newsletter (including AGM paperwork) has now been posted to all members, and can be downloaded here. 21st May 2013 – We have also updated our brochure, which has been revamped to explain the work we do, and make it easier to contact us. This can be downloaded here – or contact any Committee Member for supplies. 21st May 2013 – Various changes have happened since the last update to our Timetable Library in January 2013. Service X31 has had various cuts imposed by Centrebus, and as a result, connections are not as easy on a Saturday – the replacing Service 74 provides a limited replacement. Minor changes have been made to Connect49 following passenger feedback, meaning easy connections to Bedford and Milton Keynes on different days of the week. Visit our Timetable Library for all the information. 21st May 2013 – A number of other commercial changes are largely on services connecting with those to/from our own area – those around Bedford and our areas of Central Beds have been largely quiet. There have been tweaks to Service 50 to improve rail connections. An extra journey has been added to Service X5 has ben added to the timetable in the peaks, but it does not enter our coverage area. In addition, a new stop is being added at Eaton Socon, Little End Road, for easier access to the industrial estate and shops in this area. Visit our Timetable Library for all the information. 25th January 2013 – One minor piece of news regarding Stagecoach X5 between Cambridge, St Neots, Bedford, Buckingham, Bicester and Oxford. With effect from Sunday 10th February, some changes will be made to the bus stops in St Neots. An extra stop, both directions, will be made at Loves Farm/Cambridge Road, to replace a withdrawn local Service X4. At the same time, coaches towards Bedford will be moved stops near St Neots Station from Longsands Road to Manor Farm Road (in this direction only). This change is on road safety gtounds, for the new one will feature a bus lay-by instead of a roadside stop. Finally, the stop near Eaton Ford at The Crescent/Peppercorns Lane has been moved back to the one near the George & Dragon PH, following discussions with St Neots Town Council. The stop at the George and Dragon was one with no bus service following other changes, and this move rectifies this. For full details and maps of the changes, visit this post on the H2T Transport Blog. 17th January 2013 (fixed 19th) – Forgot yesterday to mention that Services 27 and 29 have been tweaked from early 2013. Service 27 now includes an extra bus on schooldays to Risley to bridge a three-hour gap. Service 29 now also includes Riseley (instead of Thurleigh and Little Staughton) Sharnbrook by local requests. Once again it’s a case of “use it or lose it” – download a new 27 or 29 timetables here. We have also uploaded the revised edition of the Central Beds books for Area 1 (Dunstable), Area 3 (Leighton Buzzard) and the new edition of Area 4 (Shefford and Stotfold) from January 2013. These can all be downloaded from our timetables page too. 16th January 2013 – Happy New Year! We have increased our basic membership rate, for the first time in the history of the group (2005! ), to reflect much higher prices such as postage. As a result our renewal cost has increased from £3 to £5 for an individal. Having said that, you can also subscribe as a family for £5 – the same price – meaning those who have two living at the same address now save £1! As a result we’ve updated our brochure for download. You can download our Christmas 2012 Newsletter now also. 1st November 2012 – your webmistress has been on the move – as have quite a few services! From 8th November 2012 some more changes around Bedford – with Service 5 extended to serve Waitrose and Caxton Road, Service 5A withdrawn, Service 6 no longer running into Woodlands Park but partly replaced by changes to Service 28, Service 7 extended to Aldi on Church Lane, Service 8 has a new timetable, and some other school routes change too. Our timetables page has been fully updated with new timetables, starting on Sunday 4th November 2012. This includes a new Bedford town bus map, a Central Beds county map, plus tonnes of other stuff in (and outwith) our coverage area, but still within the former county of Bedfordshire. 10th September 2012 – three updates done with the August 2012 newsletter, the new plan of bus stopping arrangements, and the new Service 62 from Cranfield to/from Milton Keynes UPDATED 31/10 – new timetable in timetables page – as is Bedford 61 , which is now a public service too. The Timetables page will be updated fully in the coming days and weeks. 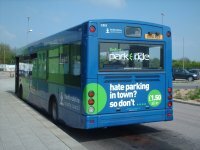 22nd July 2012 – timetables page updated with new timetables, in addition to those mentioned below, including changes to Service 391 between Stotfold and Stevenage late this month. Also, May 2012 newsletter now online for download. 17th July 2012 (updated 18th July 2012) – Some changes are being made next week to rural services in the north of the current Bedford Borough Council area – Sharnbrook, Knotting, Melchbourne, Stevnington, Harrold, Odell, Renhold, Great Barford, plus Service 29 to St Neots. At the same time, changes to Services 42 and 44 heading south will occur, including some extra peak time 44’s, part-funded by local housing developers. Click here for a full list of changes, plus timetables to download. 17th July 2012 – Speaking of St Neots – if you use bus services in the east of our county, or visit Cambridgeshire on a regular basis, you might be interested in the new St Neots Area Bus Users Society. Their first meeting happens on Saturday 28th July 2012 at the Priory Centre, St Neots, at 10.45. If you’d like to help out, the group founder Julia Hayward would be pleased to hear from you – get in touch here. 10th July 2012 – As a result of campaigning and work by Colin Franklin (our vice chair) over the last few months, Bedford now has a bus station layout that allows space for Grant Palmer and Cedar Coaches services to stop too. Buses formerly stopping outside QD on Greyfriars, or in Harper Street, have now moved into the bus station. The stop letters are still the same, just the location has moved. Click here to download a map of the new city centre bus stop layouts. 10th July 2012 – After tireless work on our consitution by Peter Williams (secretary, treasurer and chair in a number of roles over the years! ), we now have a new Constitution, whch explains who we are, and what we do. Read a copy here. 24th April 2012 – From this Sunday (29th April 2012) Services 49/50 (Kettering – Rushden – Bedford) will be changing (new timetable now online). anging to a 49/50. To eThis service currently does a local bus service 17 within Kettering, to the General Hospital and Leisure Pool, between 49/50 journeys. As part of the change, the service will run through end-to-end as 49/50 rather than 17 then chnsure the service compiles with UK Drivers Hours legislation (and does not fall into the more stringent EU requirements) the service will be split at Kettering – thus bus will leave Bedford as a Kettering 50, then change the display to read Leisure Pool 50 or something similar. It does mean now that through fares will be availabile from Rushden and Bedford to Kettering General Hospital, during off peak hours. 16th April 2012 – our Annual General Meeting will take place at Bedford Central Library (meeting room) on Saturday 16th June 2012, at 10.15. Our Guest Speaker will be Mr Stephen Morris, General Manager of Bus Users UK. 12th April 2012 – some changes will apply around Cranfield with Buses 1, 17 and 158 replaced by a faster Service 45 by Grant Palmer, which will run fast to Milton Keynes. Click here to download the new timetable for Service 45 around Cranfield, or click here to download the complete timetable and atlas-style map for all bus services in Milton Keynes. Around the same time (outwith our patch normally), further changes are happening around Leighton Buzzard – click here to download the complete new CRC timetable book. There is also one for the Dunstable area. 12th April 2012 – Further to the message below about the 755/757, also added to the Timetables page is one for new EasyBus Service EB9. 12th April 2012 – Megabus.com services to Europe were mentioned here last month. The stop in Milton Keynes has been relocated to Kingston Centre. 14th March 2012 – it’s been a little while since this page was updated, clarifying a number of matters. The Service 28 timetable we previously had for download turned out to be replaced without warning, so the issue which we had in good faith turned out to be incorrect. Click here to download a corrected version. Centrebus’s timetable for Services 188 & 190 changed twice since publication – with the third change happening before the second one could take effect. Once again, the timetable, as far as we know, can be downloaded here. 14th March 2012 – fancy going from Bedford to Brussels by bus, with only one change? Megabus.com is now advertising a new direct service from Leicester via Milton Keynes Coachway (for X5 or 40 to Bedford), central London, and onto Brussels and Amsterdam. Fares are on sale from £1 + 50p booking fee at www.megabus.com/uk and you can see a timetable for Megabus Europe services via this link. Timetables for X5/40 are on the Timetables page. 14th March 2012 – outwith our normal patch, but still within the former county of Bedfordshire is Arriva GreenLine Services 755/757 between Luton and London Victoria. Following passenger growth, the timetable is being enhanced in May, from 3 to 4 coaches per hour over the main section of route. In April, Arriva Luton changes to Services 31, 60 and 70 see Arriva’s Sunday Service 60 renumbered 31, and changes to these routes too, from 1st April. New editions of these are on our Timetables page. 8th January 2012 – further to previous entries about Services 6 & 28, you can now download new timetables for Service 6 or Service 28 LINK REMOVED AS TIMETABLE INCORRECT – SEE 14th MARCH 2012 ENTRY via those links, or via our Timetables page. You can also download a summary of the Go-Whippet Coastal Services for 2012, or you can download full timetables from this link. 1st January 2012 – Happy New Year for 2012! 1st January 2012 – forthcoming changes for early 2012. Stagecoach in Bedford Service 6 will be revised at Woodlands, and will terminate at the roundabout at the entrance to the estate – see this announcement from Bedford Borough Council. Minor changes to Grant Palmer Service 28 to follow in the coming days. Grant Palmer Service 74 has been withdrawn, and replaced by a new Service 72. Grant Palmer Service 202 will now be operated from Centrebus. Toward the end of January, Centrebus Service 82 between Hitchin and Biggleswade will be merged with Services 188/190 in the Biggleswade and Sandy areas. This will remove the link to Hitchin station, and some estates in Hitchin. These will be replaced with other services, change at Hitchin town centre. Our Timetables page has been revised and updated with all of these – although the timetable for Service 28 was not ready at the time of uploading this information – and Service 6 may only be a change of timing point location. 1st January 2012 – BABUS’s Bulletin Board is now “try before you buy” – you don’t need membership to view the public pages. Members get to post, as well as to acccess specifically members-only content. Feel free to browse the Bulletin Board, and do apply for Bulletin Board membership if there is something you’d like to say – either as a member or a visitor. 1st January 2012 – we have also updated the range of Links on our Links page, and uploaded the Christmas 2011 newsletter. 22nd August 2011 – Bookings have now opened for County Connect, which is a demand-responsive bus service operated by Centrebus for Northamptonshire County Council & Lincolnshire County Council. In our area, the Nene Valley Service C16 will also stretch into Bedford Borough, covering Melchbourne, Yeilden & The Knottings. The website opened today with information. You can also download the User Guide (with two free journey vouchers!) and the Nene Valley Information Leaflet from our website. These can also be downloaded from our new Timetables listing – look under C.
21st August 2011 – changes have now happened across Bedford. We now have a wide range of current – and forthcoming – timetables for download on the Timetables page. 21st August 2011 – Spring 2011 and Summer 2011 Newsletters added for download, and updates to our Links page to reflect the operators we cover. 21st July 2011 – Major changes – with some substantial improvements in certain areas – will be occuring to bus services around Bedford borough from 21st August 2011. You can download the BABUS response here. There was originally a downloadable complete timetable file, but this has been replaced with updated information on the Timetables page. For the updated list of most changes, click here. 12th May 2011 – Our telephone and fax numbers have changed! See the “Contact Us” page. 12th May 2011 – As part of the forthcoming Milton Keynes area changes, the current Services 1, 1A, 1B, 1C from Arriva/MK Metro between Bletchlety, Milton Keynes, Newport Pagenell, Lavendon or Astwood and Bedford will now run as far as Lavendon (except on Sundays, when the 1 will continue as 1A to Bedford). Stagecoach Pluto P1 between Bedford, Lavendon and Northampton will be revised to display Service 41, and run via Olney once more. In addition, Stagecoach will operate a new Service 40, between Milton Keynes, Newport Pagnell, Astwood and Bedford, replacing Arriva 1-1C. You can download the new Arriva 1/1A timetable, and the new Stagecoach 40/41 timetable. 12th May 2011 – Stagecoach services 404 and 406 to/from Huntingdonshire were due for withdrawn from 17th April 2011. As a short-term measure, a replacement contract has been awarded to Go-Whippet. You can download a new timetable here – this includes all the new West Hunts routes, inc. to/from other towns. 29th March 2011 (corrected 1st April 2011) – Cedar Coaches Service 152 will be split into two different services. Route 152 will remain in operation between Bedford, Tilbrook and Kimbolton (also Stonely on school/peak time journeys), but the section beyond to St Neots will now be covered by a new Service 150 by Nene & Ouse Valley CT. This has been done at the behest of Cambs County Council, who wanted to take the St Neots end under their own control. A composite timetable showing all journeys on this corridor has been put together by our webmistress, and you can download a copy here. 29th March 2011 – A new service from The Villager will start today, and provide a service every Tuesday and Thursday from Willington and Great Barford to/from Tesco, Goldington Road. Click here to download an information flyer. 29th March 2011 – Central Bedfordshire Council have produced a set of five new timetable books, to reflect the changes to the network across the area from yesterday (28th March). You can also download these as PDF’s here – choose from Biggleswade & Sandy Bus Timetable, Dunstable Bus Timetable, Flitwick Ampthill and Cranfield Bus Timetable, Shefford and Stotfold Bus Timetable, Leighton Buzzard, Linslade and Woburn Bus Timetable, or the complete network map. 31st January 2011 – All the 2010 Newsletters can now be downloaded from the Membership page. 8th September 2010 – We have recently been hard at work analysing the bus stop provision in both Bedford Borough and Central Bedfordshire Council areas. In the latter, we have recently completed a comprehensive audit. You can download our summary of provision in Central Bedfordshire, plus individual local files for Potton District, Biggleswade & Sandy, Arlesey, Shefford and Clophill, Blunham and Northill, Ampthill, Flitwick Maulden and Harlington, Cranfield, Marston Vale and Silsoe, as well as an Index. Do let us know your views on local bus stop and shelter provision. 8th September 2010 – Some additional links have been added. 3rd September 2009 – Some timetable links have been added, in addition to the timetable information that can be found via the sites on the links page. 14th May 2009 – some back issue Newsletters added – these can be downloaded via the Membership page. 5th May 2009 – new Bulletin Board now open. If you have any problems in signing up, please email Suzy.